I have made this cake, and many others, many times. I forgot to level the cake batter in the pans before I baked them. They weren’t level. My cake kept sliding off itself. CT got on the table and took a handful out of each of the three cakes while they were cooling. This cake needs to be refrigerated. It was almost 100 degrees at the park where I met my friend. My chocolate loving friend didn’t like the cake. Too much chocolate! She sent it home with me. I put it back in the fridge when we got home and as it cooled went to trying to prop it back up on itself with the icing as it slowly stiffened. Then Brent decided he wanted a piece of the cake. When a 4 year old takes a triple layer cake out of the fridge, he does not grab it by the bottom base. 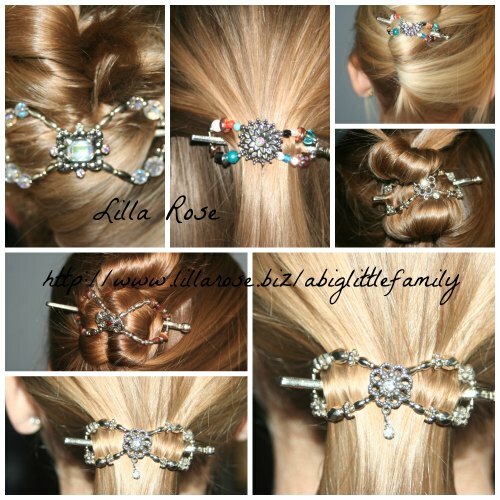 I grabs it by the top where it is easiest to hold. When I suggested that we throw it out and call it quits on the STUPID cake, he started crying, so heartbroken that he would be the last straw on the yummy, ugly, ahem, cake. I decided that since I had mopped in the last 24 hours it probably wouldn’t kill us. I put it back together again. and when it was all said and done they gave up and didn’t put him back together again!!!! ← The story of us. Part fifteen. 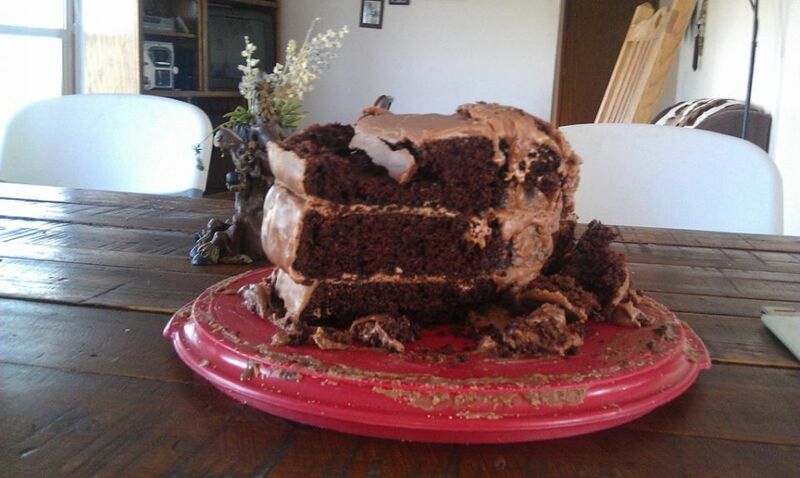 It’s hard to believe your ‘friend’ turned down your cake. Really? I’d say “her loss”, and Brent’s gain! 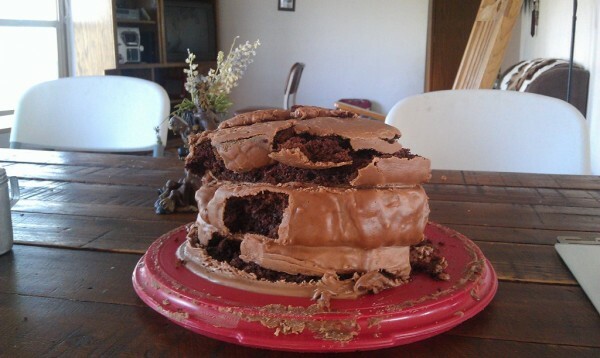 Not the first time a cake had to be put back together – or not! 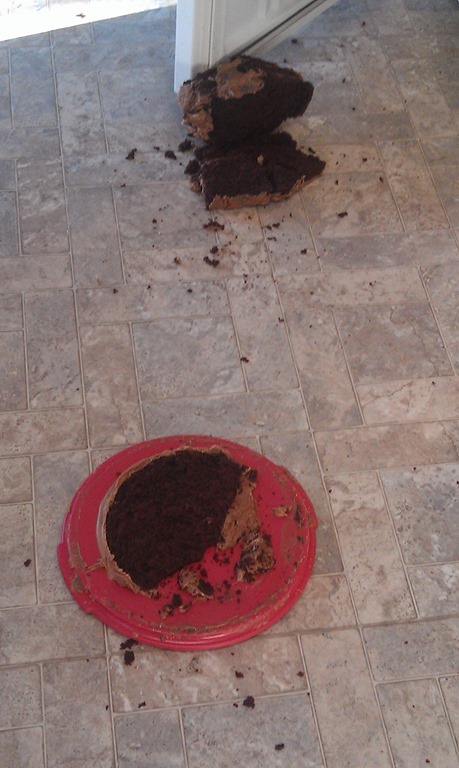 The cake looks delicious….even after the fall on the floor. Wish I could help you eat it! how sweet of you to make your friend a cake! Your too kind Kayla! It looks awful, but it still tasted alright. Apparently it didn’t pick up to much dirt from the floor.